I am fascinated by money. Who has it, who controls it, and who's earning it. So when news of Mike Trout's record-breaking $430 million (!!) contract broke earlier this week, it reminded me of just how little Tiger Woods has made in his PGA Tour career. The PGA Tour's career earnings list appears bloated until you start comparing it to other sports. Here's a look at the all-time top 10 through the 2019 Players Championship. The big caveat here, of course, is that guys like Els, Woods and Mickelson make gobs of money off the course and often do to the tune of $40-50 million a year. That's not always the case with the stars of other sports because of the target markets of each sport and the often high average disposable income that exists among golf fans. The career baseball earnings list is incredible, though. Whereas the sixth-highest on-course earner on the PGA Tour, Justin Rose, has earned just over $50 million, the sixth-highest in MLB history, Carlos Beltran, has earned over $220 million. Basketball is more of the same. LeBron James dwarfs everyone at $270 million, and just behind him are Dirk Nowitzki ($252 million), Dwight Howard ($234 million), Chris Paul ($222 million) and Pau Gasol ($215 million). In football, Eli Manning, Drew Brees, Tom Brady, Aaron Rodgers and Philip Rivers have all topped the $200 million mark, and Manning has more than doubled his on-course earnings. Eli Manning! Incredibly, even Roger Federer and Novak Djokovic have earned more playing tennis than Tiger and Mickelson have earned on the course. So you can see why $9 million matches over Thanksgiving are now a thing and how underpaid these superstars have been over the course of their outrageous careers. Timing obviously matters a lot here. Woods helped usher in -- and is the reason for! -- all the money in golf these days. He doesn't necessarily get to reap all of the on-course benefits, but guys like D.J., Rory McIlroy and Jordan Spieth ($38 million) will. Also, other sports have bigger audiences and larger followings. They are able to generate more revenue, which matters, although I would argue nobody in those leagues accounts for the percentage of their league's revenue that Tiger does in golf. Here are a few other notes I found when doing this research, mostly on the big three American sports of MLB, the NBA and the NFL (obviously soccer players would crush Woods in this category, too, but I didn't feel like dabbling in exchange rates for an hour). 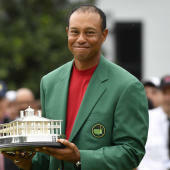 • The following athletes have more than doubled Tiger's on-course earnings: Eli Manning, Dwight Howard, Dirk Nowitzki, LeBron James, Alex Rodriguez, Derek Jeter, Albert Pujols, CC Sabathia and Miguel Cabrera. • The following athletes have (hilariously?) made more money than Tiger over the course of their careers: Alex Smith, Joe Flacco, Andrew Bogut, Hunter Pence, Jayson Werth and Bartolo Colon. • Austin Rivers has made more in his on-court career than Rory McIlroy. Rivers is three years younger.